Our Signature 2 Inch Cordless Wood Blinds come with a cordless lift. 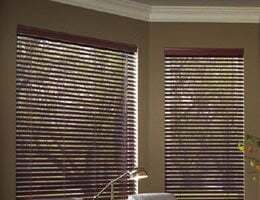 Simply raise and lower the blinds by grasping the bottom rail of the wood blinds. No lift cords means increased safety for children and pets. Operation of the tilt control with a tilt wand. Exclusive lift control designed to hold the wood blinds securely in place. Made with the same wood blind slats as our Signature 2" Wood Blinds so the colors match and are perfect for larger windows to match the blinds. Note: A clear tilt wand will come to control the tilt of the blinds. A lift and lock button is on the center of the bottom rail to raise and lower the blinds and lock in place. W: 20" 21" 22" 23" 24" 25" 26" 27" 28" 29" 30" 31" 32" 33" 34" 35" 36" 37" 38" 39" 40" 41" 42" 43" 44" 45" 46" 47" 48" 49" 50" 51" 52" 53" 54" 55" 56" 57" 58" 59" 60" 61" 62" 63" 64" 65" 66" 67" 68" 69" 70" 71" 72" 0/0"1/8"1/4"3/8"1/2"5/8"3/4"7/8" H: 12" 13" 14" 15" 16" 17" 18" 19" 20" 21" 22" 23" 24" 25" 26" 27" 28" 29" 30" 31" 32" 33" 34" 35" 36" 37" 38" 39" 40" 41" 42" 43" 44" 45" 46" 47" 48" 49" 50" 51" 52" 53" 54" 55" 56" 57" 58" 59" 60" 61" 62" 63" 64" 65" 66" 67" 68" 69" 70" 71" 72" 0/0"1/8"1/4"3/8"1/2"5/8"3/4"7/8"
I have ordered these blinds for my home and for clients homes. I have ordered these blinds for my home and for clients homes. They are Wonderful and we all love the fact they slide out for easy cleaning unlike blinds with stings and holes. Nice quality product. If you have inside mounts they hang really nicely. Highly recommend. We ordered the cordless wood blind for a door. We ordered the cordless wood blind for a door. Very good quality and easy to install. It was manufactured just slightly too short, but not enough to send it back. We will definitely order from Blind Chalet again! Love love the product. Beautiful quality... Easy to install.